Last night, I went to see Young Thug sing all over NYC's Terminal 5 stage at his release concert for his new album Beautiful Thugger Girls. 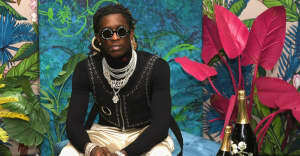 During a brief pause in between songs, Thug reached out into the audience to engage with fans. As clamorous teens stretched to gift him with blunts, one of them handed him something a little more peculiar — a fidget spinner. I screamed to my friends to look at Thug, who looked puzzled and inquisitive. He raised the mic to his lips to ask the crowd: "What's this?" Watch above as he gives the spinner a go — and returns the love back to his fans.